We offer TLC with lots of carrots, automatic waterers, misters, barn fans, round pen and canal riding. We also have a grassed area where "arena" work can be done. 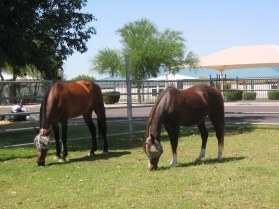 Horses are fed twice a day - we offer individualized feed programs - stalls are cleaned twice a day and every horse has time on pasture each day, except during irrigation when they have time in the roundpen to stretch their legs. Our friend from Alaska enjoying a pleasant winter day, but remember it is a "dry" heat in the summer! These are some of our stalls, facing west with the new city wall behind. The barn includes a 12x12 stall with a run, and 12x16 foaling box with its run. The outdoor half-covered stalls are 12x 24. All the stalls have misters and outlets for fans. 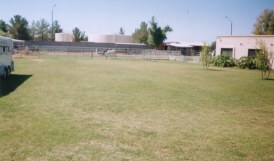 This picture also faces west, and shows the roundpen (on the left), the small pasture and three more outdoor stalls. These stalls are also partially covered and are 15 x 20. 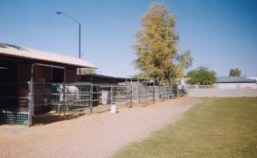 The pasture stall to the right is 12x16. All stalls have automatic waterers. Our horses are turned out for at least an hour per day either in this pasture, which we call the backyard pasture, or the small pasture. The pastures are irrigated regularly throughout the year, which keeps the grass refreshed. During irrigation the horses are turned out in the roundpen for a chance to stretch their legs. This looks like a lawn, and it is, but we ride on it too...it is our "arena". Horses and riders learn not to rely on walls or fences to keep themselves straight! The city has just recently erected a wall which cuts down on road noise and increases our privacy. out to the mountains or the Salt River riding areas for a change of scene. 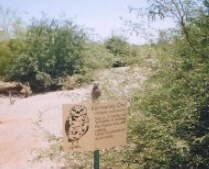 If you look carefully at the picture to the left, you can see one of the burrowing owls sitting on his sign, rather than by his burrow! 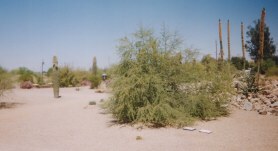 There are signs throughout the Preserve identifying the various types of vegetation and habitat as well as the wildlife. 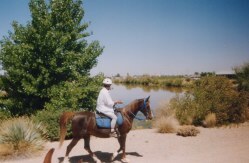 We are allowed to ride on the multi-use trails, and every time we ride there are different things to see - hummingbirds perching on a mesquite tree, ground owls by their burrows, rabbits, ducks and other water birds on the ponds, etc. 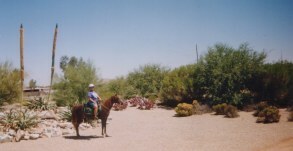 A friend from Alaska is riding one of our Arabian mares, Kandi, at the Preserve. In the background is one of the holding ponds which provides habitat for ducks and other wildlife. This is another view of some of the natural habitat at the Riparian Preserve. 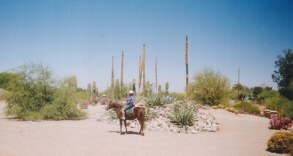 Taffy being ridden along a trail in the Preserve beside one of the wildlife ponds. 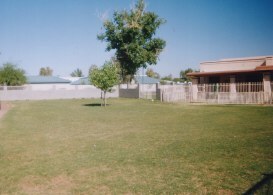 The Maricopa County Regional Library is in the upper right background. Rocking D Arabians now owns MP Emma! We are so excited to have this beautiful, sweet mare -- thank you Melanie! Mark of Fame daughter and she is very sweet! Here Emma is enjoying her first time out in our pasture. outstanding baby in the Spring of 2008! 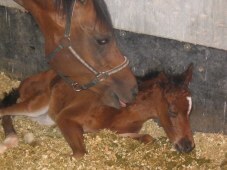 Emma with her new filly, born on Mother's Day, May 11. 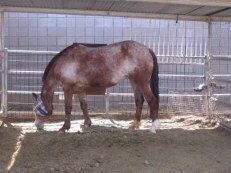 "EmmaLee" is growing very fast and now at age 6 months is ready for a new home -- see our "For Sale page". 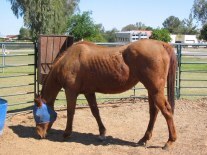 This is "Happy" -- a 4 year old Quarter/Mustang gelding who arrived here around the middle of April. He is a really sweet boy and a "miniature" of his big brother, Easy (see below). Happy has been sold and is still with his older "brother" -- Easy. They are both doing a lot of trail work we understand and loving it! Don and Diane Blanchard have bought as a "replacement" for Easy who has been sold. 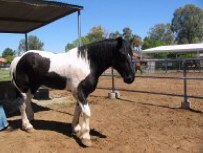 He is easy going and has wonderful gaits. Since arriving he has blossomed and is showing interest in his surrounding and in people. she will keep him and let Don have Happy! "Happy" is Diane's first horse and his favorite play toy is a stuffed rabbit. He actually will "fetch", shake, and throw the toy and give it back to Diane. He is the perfect horse for Diane and she is having a wonderful time getting to know him. 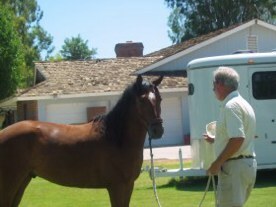 Her husband, Don (who owns "Easy"), has taken Natural Horsemanship lessons with Gary Woods and he is using those same techniques with Happy. April 2, 2005. Her last boarding facility was not taking very good care of her. The left TOP photo shows her on arrival and the left BOTTOM photo shows her one week later -- defintely getting better. The ABOVE photo shows her as she looks now, her feet done, teeth floated and her weight is perfect! 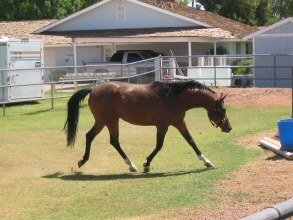 This 26 year old broodmare definitely is feeling better and glad that her owner found the Rockin D! and misters so she moved over when an opening came up. 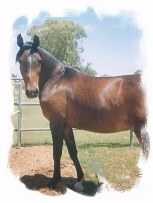 is a 16.2 hh, 18 year old Standardbred mare who arrived May 15, 2004 when her family arrived from Maine. 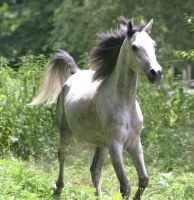 Summer used to be a schooling horse, and is now enjoying life as a one-owner/rider horse. 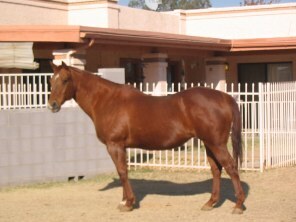 UPDATE: Summer and her owner have moved to Queen Creek -- Megan and family into a new house and Summer into a new boarding facility (AM Sunset Farms) -- another Arabian Farm -- she just can't get away from these wonderful Arabians! She is close enough that we can still get together sometimes -- Summer we are missing you and Mom but I know you are enjoying that big arena and the QC washes to ride in! UPDATE: SUMMER IS BACK "HOME" -- SHE ARRIVED ON EASTER SUNDAY 2007 -- SHE WILL BE LIVING IN A NEIGHBOR'S PASTURE, BUT AUNTIE MARY WILL STILL BE TAKING CARE OF HER -- WELCOME HOME, SUMMER! Here is Summer in her new pasture with Taffy who will be keeping her company all summer long -- they have become very good friends -- when Summer was here before they used to go on trail rides together. This way, Summer gets to keep her exercise up and hopefully help her hip problem and Taffy gets to hang out and be a "horse" for the summer -- she even has kept her whiskers! We are sad to note that Summer was put down due to a continued lameness in her hip. 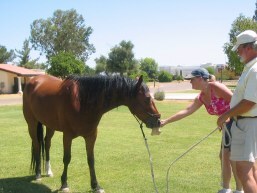 Just recently Taffy has joined Kaladdinn down in Queen Creek so Megan daughter, Maddie, can continue with her riding lessons. I understand she is having a great time! 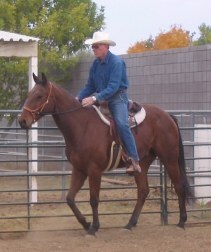 Gary Woods -- just started under saddle. UPDATE: EASY HAS BEEN SOLD TO A STUDENT OF GARY WOODS -- LOTS OF FUN TIMES AHEAD FOR ALL! AND I KNOW HE IS ENJOYING HIS TIME IN A BIG PASTURE. WE MISS YOU! In November 2005, TR So Fire Me (Blue), a 4 year old Arabian gelding arrived. He was a pasture mate of Easy, below. 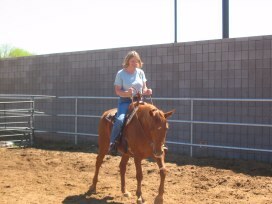 He is currently owned by Patti and is also having some Natural Horsemanship lessons. Update: Blue has made a big move -- he is now going to be living in PA -- best of luck to Patti and all the new adventures she and Blue will have together. 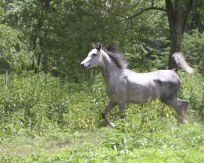 Here are updated photos of Blue -- he is still living in PA and obviously has a lovely place to run and play. 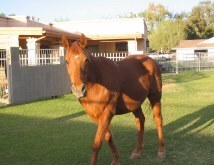 "Sarajevo MSC" otherwise known as "Sari" is a 10 year old, bay Arabian gelding who moved to Arizona from Iowa with his human "mom and dad"in June 2003. He is a real sweetheart and it looks like he and Kaladdinn will be best buddies. UPDATE: Sari and family have moved back to Iowa, Dec 2005, to be close Mary and Jake's family. They are really missed around the Rockin D and it is a good thing that Kaladdinn now has Megan to keep him busy and happy. He and Sari had become very good buddies -- please see "Our Best Photos" to see them at play! Commander, a Perchon Draft horse, was with us for a month before going into training with Bruce Novak of Monogram Morgans -- he was learning all about saddles and having someone ride him instead of driving him! was a pretty interesting guy! This is "Little Peppy Bon" (Flip Wilson). 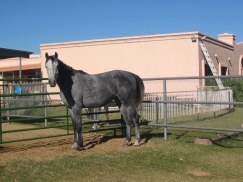 "Flip" came to our ranch in October 2001 and he and his owner, Sarah, like to do "barrels" and go trail riding. He has the great bloodlines of Doc Bar and Peppy San Badger and is a real "looker" -- this picture doesn't do him justice. 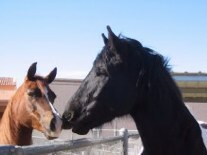 UPDATE: Flip's owner moved into a new home in Laveen, AZ and Flip has moved to a nice barn where he can be closer to her -- Flip you are missed sooooo much! MP Emma, a Mark of Fame daughter, has joined our family. 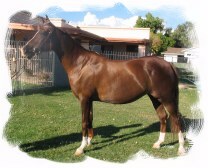 She is 5 years old and will be having her first foal in April. 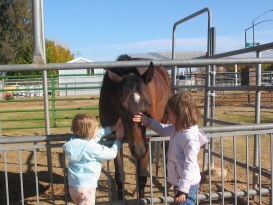 Here the grand daughters are getting to know her -- Madeline on the left and Alyson on the right -- Emma loves attention! Emma came here in June and she and I almost immediately connected. 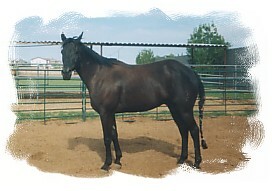 I shocked everyone when I told them I had purchased her -- the last thing I thought I would ever do -- buy another horse! I don't know what I had to eat/drink over Christmas or maybe it was the high fever I had in November, but craziness decended upon me. I have 3 horses now! My body during December was really out of wack and I was considering cutting down on the number of horses I had to care for -- obviously I felt much better on December 30 -- the day I couldn't get the thought out of my mind that I had to buy Emma and give her the love and attention that she wanted and deserved! 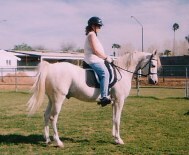 We have a lot of training to do once the foal is weaned as she is not broke to ride. Oh body, please don't give out on me!!!!!! Emma seems to be giving Kameron a "love" nudge or else she is falling asleep from all the petting -- she seems to be very happy with her new family. 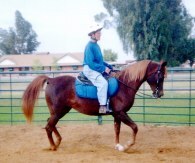 "King Kaladdinn" (Kaladdinn) a 1998 PB Arabian gelding. He has lots of friends at the ranch who make him work! Here he is with Mary S., a boarder, who really makes him think! 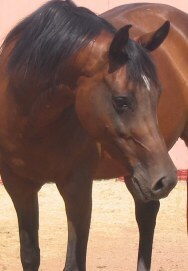 Mary has shown him in local Arabian shows earning a Reserve Champion in Hunter Pleasure. "ZA Star Zapphire" (Taffy) has been at the Rockin' "D" Ranch since she was 2 years old. 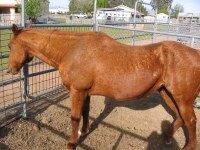 She is a 1988, 14.3 hh chestnut mare. Taffy has travelled to Pennsylvania twice with her former owners, then came back to us when her family moved back to Canada. This is Bolds Karmel Kandi (Kandi). She was born at the Rockin D Ranch on Jan 2, 1995 (her mom is Taffy) and has had a wonderful home for the past 6 1/2 years. Her previous owners decided that she needed to come back "home" when their home situation changed.